Die von unserem Verein zusammen mit der Internationalen Jugendbibliothek München organisierte Wander-Ausstellung »Anaarestan - aktuelle Kinderbuch-Illustration aus dem Iran« ist den weiten Weg von Berlin mit dem Dampfschiff nach New York gefahren. Sie wurde erfolgreich vom Hafen in die Stadt gebracht. Die Ausstellung wird nun im Rahmen der IBBY (Internationales Kuratorium für das Jugendbuch) Regional Konferenz von der US Sektion USBBY gezeigt werden. 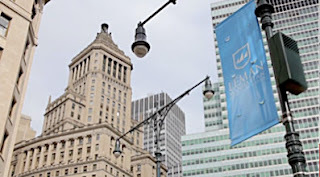 Der Kongress findet in der Léman Manhattan Preparatory School statt und ist wohl recht hübsch in Lower Manhattan in berühmten Gebäuden untergebracht. 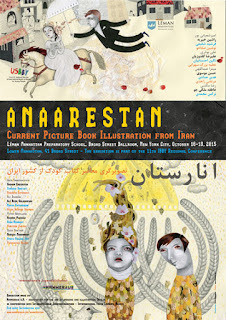 The exhibition »Anaarestan - current Picture book illustrations from Iran« which was organised by our association and in conjunction with the International Youth Library Munich went al the way from Berlin to New York by steam boat. It was then transferred from the harbour to the city. This exhibition will now be shown at the 11th IBBY Regional Conference by the US section USBBY and present the works of 16 fantastic illustrators from Iran in the US. It will be shown at the Léman Manhattan Preparatory School which is located in the historic Bank of America headquarters, Broad Street Ballroom and Cunard Cruise Line buildings in Lower Manhattan.